Long before the phrase “Native American” came into vogue, a trim, muscular American Indian in the service of the US Marine Corps came from a humble beginning on the reservation to defeat the world’s best runners in a race of epic proportion, standing the racing world on its ear and achieving enduring fame. 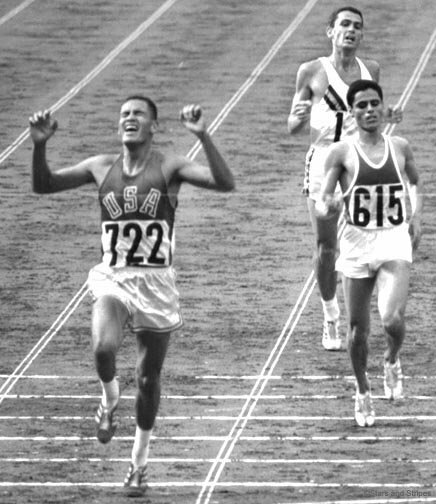 His name was Billy Mills, the race was the ten thousand meter run, and the occasion was the Tokyo Olympics of 1964. 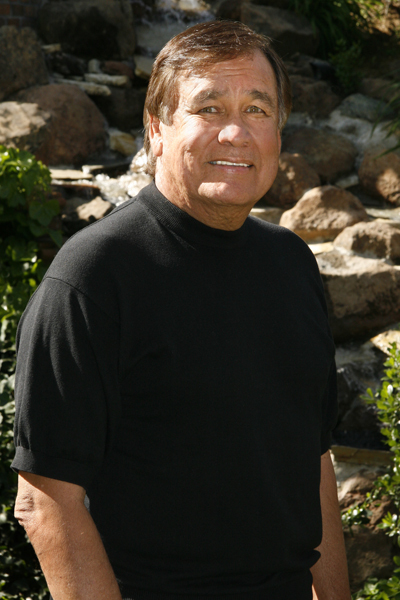 Mills is an Oglala Lakota Sioux who grew up on the Pine Ridge Indian Reservation in South Dakota. His Lakota name is Mataka Taka Hela which means “love your country” or, in its more literal translation, “respects the earth”. 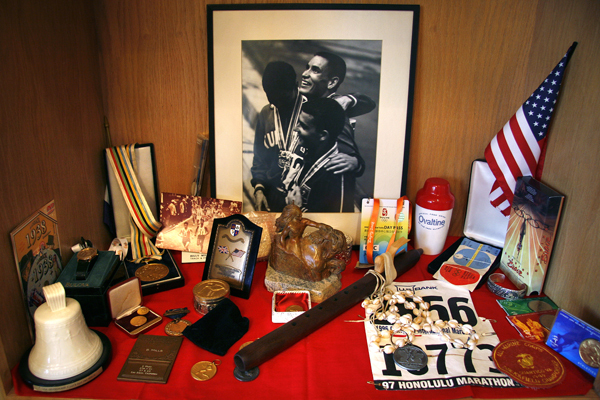 Born into poverty and orphaned at the age of twelve, he began his track career at an Indian boarding school, continued it in high school where he set a number of distance running records, then attended the University of Kansas on an athletic scholarship where the acclaim continued. Under the university’s storied coach, Bill Easton, he won the individual title in the Big Eight cross country championships and was named an NCAA All-America cross country runner three times. But no one could have foreseen Mills’ future as a track performer or the world acclaim that would come his way. The ten thousand meter run that day in Tokyo was supposed to be the personal province of Ron Clarke, the Australian world record holder, or a short Tunisian runner named Mohammed Gammoudi. There were other strong runners in the race but no one else was afforded much of a chance to win and Mills was largely ignored in pre-race speculation. 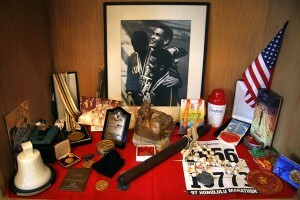 Clarke, in a seven year span beginning in 1963, set 17 world records in races ranging from two miles to 20,000 meters. Gammoudi was one of the pioneers of the African distance running powerhouse that changed the face of the sport. Mills and Pat, his wife of 47 years, have been Sacramento residents- along with their four daughters- since 1974. Initially a success in the insurance business, Mills turned to public speaking, making as many as seventy five inspirational speeches a year with Pat acting as his booking agent and business manager. “I never could have done it without her”, he says. She gave up a promising future as an abstract artist for me but thank goodness she returned to it six years ago, took a Master’s degree in Fine Art from Sac State, and is selling her work and doing extremely well.” Always keenly aware and proud of his heritage, Mills later served Secretary of Health and Human Services Wally Hickel in a study of the need for recreational programs on the nations reservations. The heritage of which he is so proud has been a key element in Mills life of success… and peace of mind. When he was eight, his mother died and his father told him, “You have broken wings but soon you’ll have the wings of an eagle if you pursue a dream that heals you. You’re feeling hate, jealousy, anger, and self pity and don’t see the virtues and values of our culture.” Mills says, “He influenced me in the practice of what we now call ‘visualization’.” Years later, shut out of a school track team photo because of his ancestry and on the verge of suicide, he heard his father’s gentle voice say “Don’t” and remembering the positive, spiritual, empowering words of that encounter, he wrote “Gold medal, ten thousand meters,”. From that moment on, he visualized the race over and over again, entering into what he understands now was a self-hypnotic state. “At the same time, I studied the virtues and values of the ancient Sioux teachings, as well as the thoughts of many of the great philosophers and religious figures and constantly reminded myself of what my father had taught me, that the daily choices we make in the journey are important in reaching our destiny. Thompson confirmed the value of visualization and stressed the importance of strategy, convincing him that he needed to stay on the lead runner’s shoulder going into the stretch if he was to win at Tokyo and advising him to train at 200 and 400 meters in the final days prior to the race so that his final kick would be at maximum effectiveness. He followed Thompson’s advice- and the rest is history. I set next to you on a flight from LAX to Albuquerque, New Mexico.It was a vert rough flight and I was so frightened. I had tears in my blue Eyes. index finger. You held it with jut a little pressure. . I turned and looked at you and you eyes were so kind and amazing. After these many years I have never f forgotten you.. I came across your web site on my iPad, looked at your pictures and read your text. I see that you are still “The Best Looking Man I have Ever had the pleasure of meeting. I send you much Love happiness and Joy..
May Gid Bless you . Thank you for sharing this story. I find it very inspiring!